My most recent layout project, and "almost" complete, this represents the terminus of a narrow gauge tramway in the back end of a country town, somewhere in pre-WWII England. The station squeezes into a tight space behind houses and a factory (which it serves), indeed the track plan and tramway-style station have a passing similarity to Wantage. This layout is built in 009 scale/gauge, and is just 3'6" by 13" to fit within an alcove beside the chimney breast in my dining room. Residing above a bureau and under some shelves it is a cramped spot, however the layout has it's own lighting pelmet, and the front of the layout is in ply varnished to match the shelves and fit into the room. The whole layout has been arranged to slide forward on runners, and have a cassette fiddle-yard attached to the end for running sessions, which sits on top of the mantle-piece! A set of trestles can be used for exhibitions. The back-story is that Awngate is a small town in middle-England which missed out by the main line railway, so the local land owner sponsors the building of a narrow gauge tramway, being the cheapest option given the hilly terrain. It follows the road much of it's 5 mile route, but about a third of the line is on it's own trackbed, including a river bridge that saves a considerable distance over the road. This enables the line to keep busy serving the mills and population of Awngate, but it is now the mid-1930's and road traffic is proving stiff competition, while the war may prolong it's life the post-war world will have no place for such a line. The layout is fairly conventional in it's construction, although the base-board has been designed to fit a cramped location, incorporates strip-lighting in a pelmet, and slides out of the alcove for operation on drawer runners. The cassette fiddle yard was built to slot into the end over the mantle-piece when in use. The cassettes have attracted a lot of attention and several people have copied them, they are constructed simply using plastic plumbing conduit - as described here. Scenically I have used some card building kits by Metcalf Models to achieve an urban look in a reasonable time, although the station building is scratch-built. Read about the buildings. Electrics are DC, with a hand-held controller run from a transformer box on the floor. More on that here. Points use SEEP motors driven by a CDU, and they and the section switches are controlled from a small mimic-panel set into the fascia for front operation. 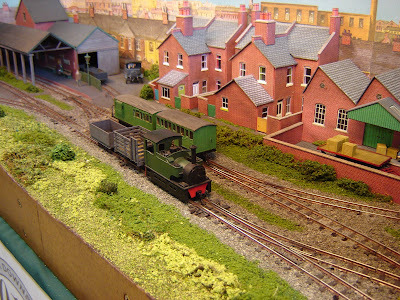 Since it was first built the layout has been developed with an engine shed, additional details, a new fiddle yard (for exhibition use), and appropriate locomotives and stock. Follow the story though the blog.